Where has my year gone? I guess we all feel the same at this time of the year. 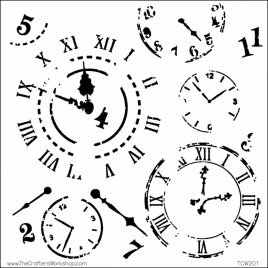 I know you will all be busy with last minute preparations for Christmas but I do hope you take some time out for yourself this week. I have just received the NZ National Quilting Symposium booklet so have taken a coffee and some minutes to enjoy a good look through it. Oh its going to be a fantastic week in Christchurch. Some of my very favourite tutors are coming again and some are coming for the first time. Rosalie Dace, Gloria Loughman ,Lesley Riley and Judy Coates-Perez just to name a few. I have booked my accommodation, will load the trailer with lots of goodies and will be there with bells on. The paints I used are the gorgeous Gems. I had a ream of A3 Paper so printed my Christmas wrapping while I had the plate and paints out. So pretty.The Lumiere paints and Gems work beautifully on paper. 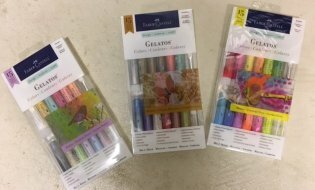 As you all know I love colour and when I spied Gelatos by Faber Castell being used in Birmingham I realised these scrumptious sticks of colour would work beautifully along side with my fabric paint range. I have not only the individual regular sticks and a few of the Double scoops but a range of sets also. 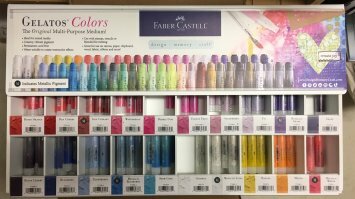 By adding a textile medium or Jacquard Colourless extender they become colour fast and therefore can be applied to fabric. 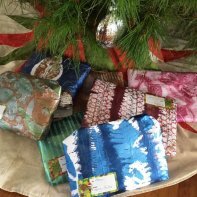 Please do check out the Modern Batiks Range as I have had a few arrive since my last newsletter. Really beautiful prints and some lovely clear blues. Also just arrived Robert Kaufman PFD cotton I have been waiting some months for this as Susan Brubaker Knapp used it in her painting classes while she was teaching here in New Zealand and the ladies enjoyed working with it as it is tightly woven. 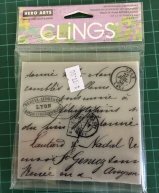 I have listed a number of new stamps and stencils .These are found at the beginning of the Surface Design stamps and Stencils Category.The Finnabair clear stamps are cute and very good value at $4.00. 1st,2nd and 3rd April 2017 I have the pleasure of hosting and running a class with Kim Thittichai here at One Tree Point. This class was full but recently I have had a couple of cancellations therefore I am now able to advertise.This class is limited to 16 places only so its important to contact me immediately if you are interested in attending.First come first serve .I know Kim has many followers and these spaces will be snapped up. 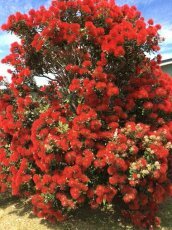 Isn't this Pohutakawa tree a beauty. I spotted it when I went to purchase my tree. Have your family members asked what you would like for christmas? Why not ask for a Tulis Textiles Voucher? I can email it , you can print it and include with your card. As it is the time for giving, I am not charging postage when the Christmas voucher is redeemed. From One Tree Point to you and your family where ever you may be, safe travels and happy holidays.